With all those delightful April showers bringing us May flowers, garden projects are next on the list. Everyone knows that getting kids to help is always fun, but the prep for the garden can be fun too. One of these projects could be taking that rainy Saturday to make your own DIY plant markers to tell you if that sprout coming up is carrots or cauliflower. We found some great ones to share with you and the kids. This is a great one for the little ones. All you need are a bunch of sticks (small branches from cleaning your yard up are great) around 8 inches long, a handful of clothespins and a permanent marker. You might want a couple of colors to make it interesting. Write the name on the side of the clothespin, push the stick in the ground next to the planting area and then clip your clothespin to the stick. You could actually do this with any small plastic animal but the dinosaurs are especially fun! Have your kids outgrown their collection? Then here is a great reuse of them. Write the name of the plant with permanent marker on the critter and then put it near the plantings. Don’t forget to let the ink dry before placing the marker. These work especially well in container gardens. If you have some old keyboards from dead computers lying around, this is easy. You can also ask the local schools or community centers for old keyboards. Pry the individual letters out and mount them on chopsticks, the wooden kind you can get at dollar stores. Since different keys have different holes, you might want to check to see if the holes are square or round. Hardware store dowels work too. You may have to change the letters on a few to make them all work for you. Insert dowels or chopsticks into keys, spell out your plants and you have some really cool looking DIY plant markers. Kids love searching for just the right rock. 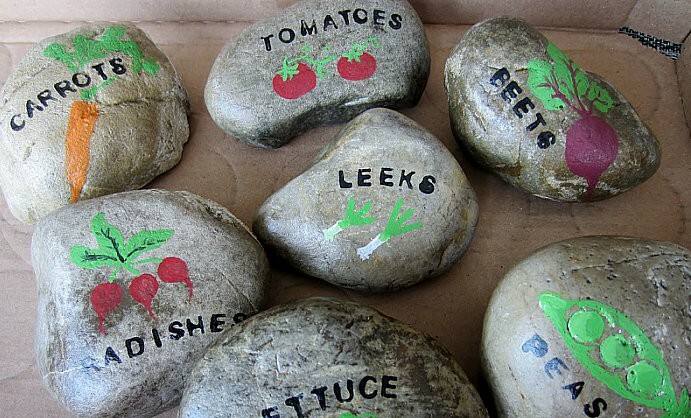 If you have leftover house paint they can add some color first to the rocks and old bricks. Then using a permanent marker, write the name of the plant. You can also use up those old acrylic painting sets for this. 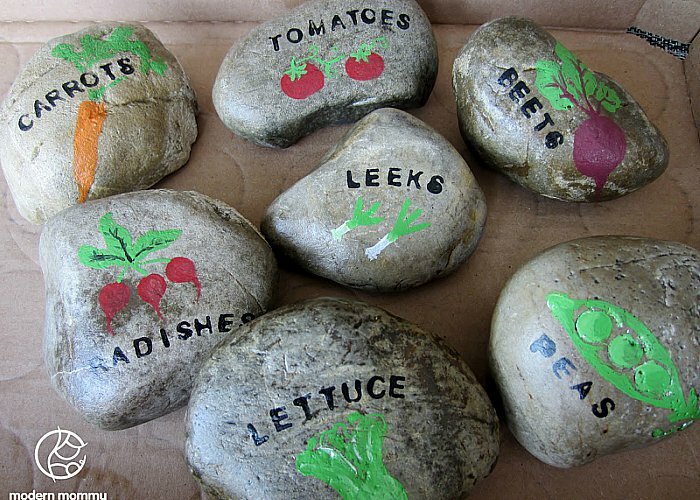 This is also a great rainy day craft if your kids love to just paint the rocks and then scatter them around the garden. So grab those supplies and your kids and start making your own DIY plant markers today. Spring is a great time to do fun projects like these with the whole family.